Every sales rep knows how tough experience can be on you, especially if you are new in the selling industry. In addition to knowledge, the sales industry requires great intuition and a variety of tricks that help you avoid losing big deals. And while people learn best through the first-hand experience, it is highly important to look for tips and strategies that will help you with your selling efforts. Fortunately, there are excellent authors who decided to share their knowledge with less experienced sellers. These 10 books should help you advance in your career. Before this book came to point us to the right direction, the world of sales was full of opinions such as 'you can sell anything if you are a good salesperson. Presenting a much more realistic approach, the author Jeff Thull explains that this process is much more complicated than people think. According to him, in order to sell something, you must assist your clients in setting clear goals, understand all the alternatives, and make all necessary changes to finish the sale. Basically, the book is a guide for survival in the world of sales. It speaks of selling cross-border and cross-company, and how to juggle multiple agendas and decision makers. According to Jil Konrath, one of the biggest mistakes you can make in the sales business is to assume that you can approach every company in the same way. If there were one way to sell products and services to everyone, the sales market would be blooming for everyone who tried to work in it. To help people out, the author of this classic explains how to manage large companies and turn their politics into your advantage. In a time when decision makers are so hard to find, you can truly benefit from this guide. Instead of making those endless calls where no one responds or they blow you off constantly, you should learn as many sales strategies as possible. This book should help you get some insight into dealing with big companies. Written by Brian Tracy, you are looking at a book filled with selling strategies. But, these are not your ordinary sales techniques. Tracy helps out salespeople to motivate buyers and sellers, as well as use psychology to create a great opportunity for each party involved. This is the goal of every businessperson who works in the world of sales – being the greatest salesman in the world. As such, you have a high reputation and the best income there is, which makes the title of this book one of the most intriguing in the sales book collection. Also known as one of the top most influential business books of all time, this classic allows you get a completely new perspective of the art of selling. After you are done reading it, you will start seeing selling as a way to help people achieve the dream, not manipulate them into making a decision that's good for you only. It's a quick, yet very good read. Richardson uses a very short text to explain the sales cycle. Her wording is straightforward and simplified, unlike what most other sales book writers use. If you are ready for some light and educative literature about the sales industry, this is a great book for you. Tom Hopkins has had a very good run in the world of sales. Knowing this, you cannot miss this book if you want to become a better salesperson. According to this amazing author, selling requires managing your own fears first, after which you can focus on what your customers need. This book is an opportunity to learn how to set the right selling climate, how to prospect referrals, etc. It will also help you find the answers to some of the most common tie-downs in the industry. This is a book written by an amazing sales author who, unfortunately, is no longer with us. Zig Ziglar was very popular in the business world and has shared many wise thoughts that can lead you in the right direction. Secrets of Closing the Sale is a book that explains the best principles to base your sales and techniques upon. Written by another king in the sales world, Jeff Gitomer, this is actually a little red book. But, there is much more to it. Even though it is little, it is filled with some of the best ideas about selling, as well as some instructive solutions to the most complex business issues. If you like Gitomer's work, you may also want to read his other sales book, The Sales Bible. Every new sale is a new opportunity and success for a business, and this book focuses on exactly that. If you are looking for the best ways to bring on new businesses to purchase something for you, take a look at the techniques Weinberg laid out for you. Starting from his formula for finding new prospects to the guides for developing a good relationship with customers, this is one of the 'must read' books in the sales industry. Our last but not least choice is Neil Rackham's Spin Selling. You will probably find this book in most of the sales books lists and it is no wonder why – Rackham actually managed to turn selling in some kind of a science everyone can learn and benefit from. If you are tired of all those assumptions and anecdotes in other sales books, this book will give you a clearer perspective based on actual sales and hard evidence. By testing out various strategies, Rackham checked what works and what doesn't work in the world of sales. 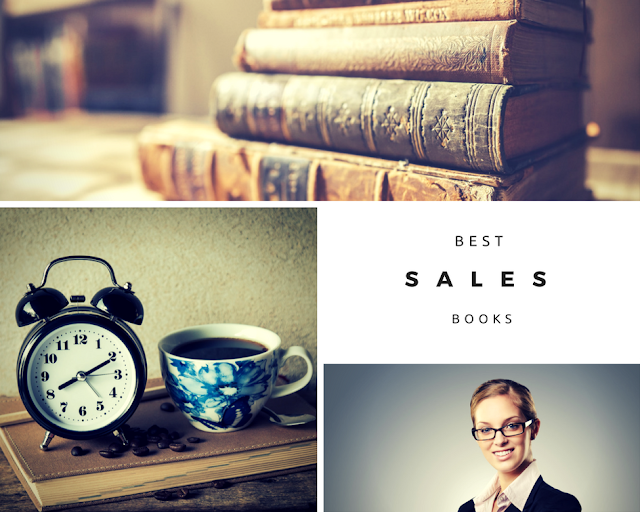 These are all amazing sales book that can improve your success and reputation as a salesperson. Where will you start? Sharon is a marketing specialist and blogger from Manchester, UK. When she has a minute, she loves to share a few of her thoughts about marketing, writing and blogging with you. Currently, she is working as a marketer at the writing service Essayontime. Follow Sharon on Facebook.